Often used in pediatric dentistry, dental sealants are thin, plastic coatings which are applied onto the chewing surfaces of the back teeth. 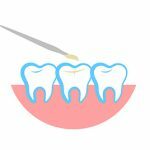 Typically, the tooth shall be cleaned, dried, and prepped by using a solution which increases adhesion, then the sealant is applied in liquid form and painted on, hardening in a few seconds. The surfaces of back teeth have many pits and grooves, where foodstuff and germs can accumulate, and there remain, as they are hard to reach with standard toothbrush bristles. Sealants are used to help prevent any decay from any germs that could accumulate in this manner. Children should generally get sealants on their permanent molars just as soon as their teeth come in – from 5-7 years old for their first set of permanent molars and usually 11-14 years old for their second set of permanent molars. Sealants are highly durable, and can last up to 10 years. The procedure is rapid and free of discomfort, and can help ensure your child or teenager is protected against the decay that in-mouth acids, germs, etc. can cause. Call, e-mail, or drop by our office today to discuss how we can help protect your or your children’s pearly whites for many years to come!